The 7277 series circuit breaker is physically and electrically identical to the 7274-2 style circuit breaker, with the exception that the 7277 series has wider calibration limits. Originally developed as an alternative to slow blow fuses, the trip free 7277 is used extensively as primary electrical circuit protection on general aviation aircraft. The wider calibration limits of the 7277 has also resulted in applications including protection for data processing and telecommunications equipment, computers, flight simulators, construction, material handling and other industrial,electronic equipment. For use on trainer / simulator applications where all breakers are operated on low ampere control current, different ampere rating inserts (amp ratings on top of push button) can be ordered. FEATURES: The 7277 series is designed for applications that do not require the tighter performance characteristics and approvals of our military circuit breakers. The first number following 7277 is a type designator. -1 indicates auxilary (not for primary use) and the -5 has a longer push button than the standard -2. 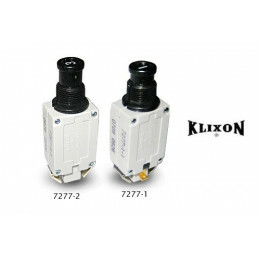 Breaker Klixon 7277 Il y a 4 produits.